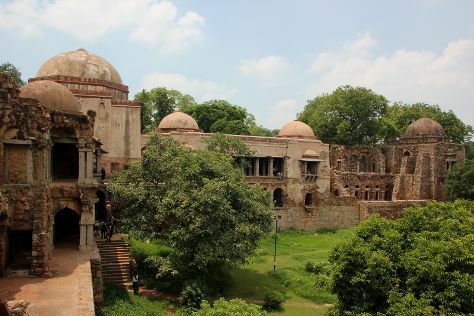 You'll discover tucked-away gems like Hauz Khas Village and Raj Ghat. Your cultural itinerary includes sights like Gandhi Smriti and Humayun's Tomb. Go for a jaunt from New Delhi to Gurugram (Gurgaon) to see Ambience Mall about 36 minutes away. The adventure continues: admire the landmark architecture of Rashtrapati Bhavan, contemplate in the serene atmosphere at ISKCON Temple Delhi ( Glory of India &Vedic Cultural Centre ), steep yourself in history at Gurudwara Bangla Sahib, and make a trip to India Gate. To find out how to plan a trip to New Delhi, use our trip itinerary maker. Malmo, Sweden to New Delhi is an approximately 16.5-hour flight. The time zone changes from Central European Time to India Standard Time, which is usually a 4 hour difference. When traveling from Malmo in January, plan for warmer days and a bit warmer nights in New Delhi: temperatures range from 22°C by day to 9°C at night. Finish your sightseeing early on the 26th (Fri) to allow enough time to drive to Agra. You'll explore the less-touristy side of things at Tomb of Itimad-ud-Daulah and Wildlife SOS Elephant & Bear Sanctuary. Get a sense of the local culture at Agra Fort and Taj Mahal. Go for a jaunt from Agra to Fatehpur Sikri to see Panch Mahal - Fatehpur Sikri about 56 minutes away. There's more to do: stroll through Mehtab Bagh and admire the striking features of Tomb of Akbar the Great. For ratings, more things to do, maps, and other tourist information, go to the Agra journey planner . You can drive from New Delhi to Agra in 3 hours. Alternatively, you can take a train. In January, daily temperatures in Agra can reach 22°C, while at night they dip to 8°C. Wrap up your sightseeing on the 30th (Tue) to allow time to drive to Jaipur. Discover out-of-the-way places like Albert Hall Museum and Anokhi Museum of Hand Printing. Get some cultural insight at Amber Fort and Jantar Mantar - Jaipur. Spend the 4th (Sun) wandering through the wild on a nature and wildlife tour. There's still lots to do: take an in-depth tour of City Palace of Jaipur, take a stroll through Rusirani Village, contemplate in the serene atmosphere at Moti Dungari Temple, and look for gifts at New Maharaja Gem Palace. For ratings, reviews, and tourist information, refer to the Jaipur road trip planner . Traveling by car from Agra to Jaipur takes 3.5 hours. Alternatively, you can take a train; or do a combination of train and flight. Expect a bit warmer weather when traveling from Agra in January: highs in Jaipur hover around 26°C, while lows dip to 9°C. Finish your sightseeing early on the 5th (Mon) so you can travel back home.